You deserve a luxurious bath after a long day at work. At Mobile Home Parts Depot, we know that you don't want to compromise on quality when it comes to parts. 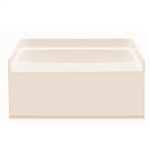 Take a look at our gorgeous mobile home bathtubs to fit almost any budget or structure. Mobile home bathtubs take standard structure sizes and contour their design to a functional size. You can have a standard fiberglass tub or even a mobile home garden tub. Simply measure the space you have to make the best decision. Consider your everyday habits in the space to avoid a cramped area. Our bathtubs for mobile homes even include corner models. You want to use all the available space in your home, but corners can tend to be dead space. Measure your corner to move a practically spa-size mobile home bathtub into the space. You'll be amazed at the difference it makes in value and functionality. Sizes from 54 x 27 up to 60 x 42, including corner and drop in tubs.